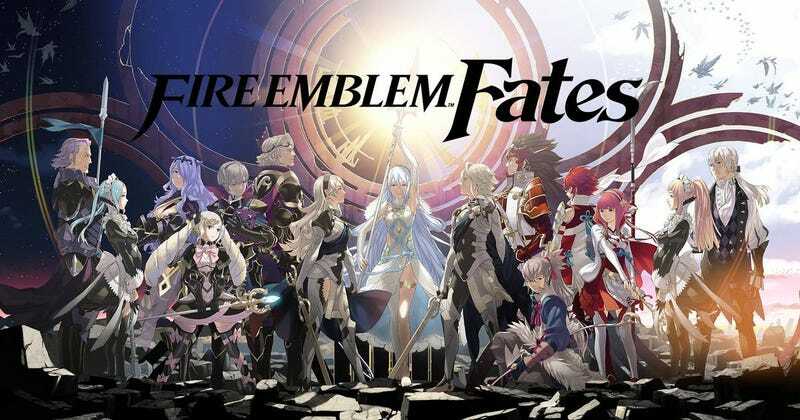 Fire Emblem Fates came out in the states in February of 2016 with three separate campaigns available. Over a year later, and with two new Fire Emblem games out, and Fire Emblem Warriors coming to Switch and New 3DS later this year, not to mention the next mainline Fire Emblem coming to Switch the year after, it’s safe to say that I’m drowning in Fire Emblem. And I still haven’t finished Fire Emblem Fates thanks to its three campaigns. The thing is, I should have finished all three months before now. I took a break between Birthright and Conquest for about two months, more or less, but I jumped into Revelations right after Conquest, barring a three-day adventure through the original mushroom kingdom with Super Mario Bros. So I’ve been actively playing through the trilogy for a little over a year. I played through over 140 hours of The Legend of Zelda: Breath of the Wild in a few months. So why couldn’t I play through roughly 100 hours of a game in over a year? Well, I think I hit the nail on the head right there. I was playing 140 hours of The Legend of Zelda: Breath of the Wild. And before that, I was playing hundreds of hours of other games. I just kind of... forgot about it. In this day and age, all different types of video games are vying for my attention. The first half of 2017 has already been incredibly good in terms of video games being released, with Persona 5, Horizon: Zero Dawn, and, of course, the aforementioned Breath of the Wild. And, as you might have noticed, these games are largely over-100-hour affairs. They’re also all looking fantastic. Meanwhile, Fire Emblem Fates is often just more of the same. I started my Fire Emblem journey very late, once it became “mainstream” with Fire Emblem: Awakening. (And yes, I play in casual mode too. I feel like my credibility as a gamer is waning by the second) I fell in love with the game, and I would still place it among the top five games on 3DS to this day. While I feel like no following Fire Emblem game could replicate the novelty I felt from my first Fire Emblem experience, I still thoroughly enjoyed Fire Emblem Fates: Birthright. Being the filthy casual that I am, its difficulty was perfectly suited for me. I loved meeting all of the colorful characters I had learned to expect from the Fire Emblem franchise, and the story was very interesting with the characters on both sides evoking sympathy, even if they’re fighting against you. Fire Emblem Fates: Conquest was both more and less interesting in different areas. From a story perspective, I felt that the game tried a bit too hard to justify my character’s motives for staying with Nohr and that the path of Birthright ultimately still made more sense. At the same time, however, it was truly fascinating to see the story unfold from the perspective of the royal family of Nohr, whom I had previously been fighting, while now fighting against my true family in Hoshido whom I had already learned to love. At the same time, there were certain story beats that were either similar to if not the same as those in Birthright. These parts were unfortunately too frequent and bogged down an adventure centered around a change in perspective with the same perspective. From a gameplay perspective, I enjoyed being in control of the characters I had been fighting against, and vice versa, as it, yet again, was a fascinating change in perspective. There were some repeats, but I was willing to forgive it because of the dynamics of pairing different characters together. What I was less willing to forgive were the repeated stages. Sometimes the objective would change, offering some variety, but sometimes it would appear to be the exact same stage with a ramped up difficulty. These problems are only expanding with Revelations. I’ve been introduced to all of the characters by this point (unless there are some new ones that I’ve yet to meet) and some stages are being repeated for the third time! It’s not that these stages are bad; they’re just boring at this point. Revelations promises to reveal all of the secrets surrounding the two previous games, while joining characters from both Hoshido and Nohr to become one big, happy family, but at this point, I almost don’t care. I still care enough to keep playing, but now it’s almost like a TV show you’ve been watching for three seasons is starting to get dull, but you might as well see it through to the end because you’re invested. I can only hope that the finale is worth the slog to get there. And then I can finally get to play Echoes, only to find that by the time I’m done with that, Warriors is out.